These cat care tips will make life for both you and your feline companion that much better. Here we cover a variety of aspects of feline care, from providing extra comfort for your cat, to health and safety, to grooming and nail care. Some of the tips below may be obvious, but some are not so obvious. Some are from my direct experience, and others are from the experiences of others. Submit your own feline care tips, too or read advice from other visitors below! An obvious tip and certainly you know this (hopefully everyone knows this already), is that you should spay or neuter your cat. Unfortunately, myths about this still persist. See these myths about cats where I debunk the altering myth and the maternity myth. So that's the first tip, spay and neuter. There are more cat care tips below. Oh, and if you need financial assistance with the surgery, there are low cost spay and neuter programs that may help you pay for it. Below are a number of other good suggestions for better feline care. Priscilla enjoys her sunbathing time by the window. 1. Give your cat a place in the sun - domestic cats love warmth so much that they've been known to burn their fur on hot stoves. They love to sunbathe, so set up a nice comfortable bed for your cat by a window so she can sunbathe. 2. Provide a scratching board - it's in the nature of every feline to scratch. Scratching provides an outlet for stress, and helps to trim the claws a bit. You can get a board with a wound rope made from sisal that works well for this. Or, you can get one of the cardboard cat scratchers, which many cats love. 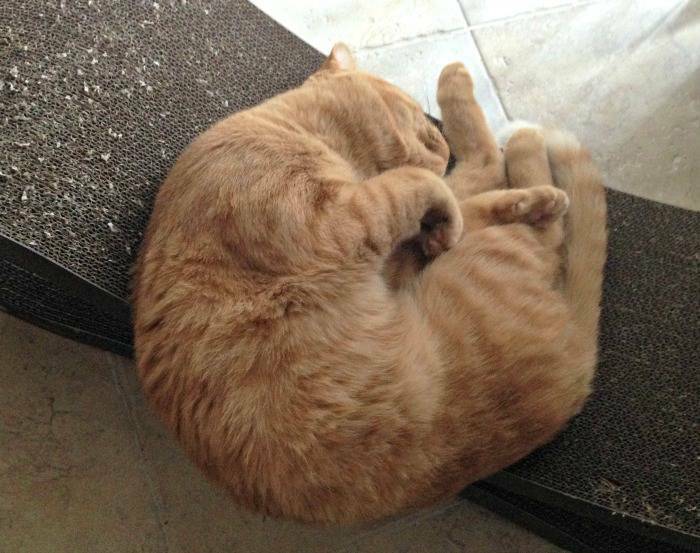 In fact, Jazzy loves his Ultimate Cat Scratcher Lounge by PetFusion, which is a cardboard model (the company sent him a free one - it pays to be cute). You can rub the sisal or cardboard with catnip to make it more attractive to your cat to scratch there. This way, your cat will be less inclined to claw the furniture. Even cats that have been declawed will instinctively exhibit scratching behavior, so you should have a scratching board or post whether your cat has claws or not. I recommend having several, strategically placed in areas where your cat frequents, or near where your cat might scratch something inappropriate, such as the furniture. 3. Give your cat a den in the mountains - give your cat hiding places around the house, preferably up high. You can buy cat furniture, such as cat trees that satisfy this need, or you can simply create a comfortable area that is protected. An area that is designated as a cat room or sanctuary is ideal for this. 4. Spread some treats around - bring out the hunting instincts in your cat and make feeding time a bit more fun by spreading treats around the house that your cat can find. Also, your cat will probably enjoy it if you toss dry food bits and let her chase them down. 5. Handle your cat often - some cats just don't like to be picked up. But, if you can start handling your cat often when she's a kitten, chances are good she'll better accept it later in life. She'll also do better when it comes time to get checked by the vet, have her claws trimmed, and so on. Get your cat used to being handled early on so it will be easier for others to handle your cat when necessary. Make sure you grab the feet and toes and massage them so your cat gets used to having her paws restrained and touched. 6. Grooming - to prevent hairballs, improve the look of your cat's coat, and give yourself an excuse to check on your cat's well-being, groom your cat at least once a week. If your cat has longer fur that is prone to matting, then groom her as often as possible. You can use any of the grooming brushes or gloves on the market for this. The Furminator is an excellent tool for removing excess fur, which can help prevent hairballs. Not all, but most cats learn to enjoy the grooming process, although some will become over-excited by it and can only take so much. Frankie gets so excited she starts to bite the brush (and the groomer if you're not quick). 7. Examine your cat for health problems - use the weekly (or more often) grooming sessions to examine your cat for common health problems. Check your cat's gums, teeth, eyes, ears (look for signs of ear mites), skin, and limbs for obvious problems. Check for signs of pain, swelling, or injury. For more details on what to look for, see cat illness warning signs, cat health problems, and cat illness symptoms. 8. Check your cat for fleas - killing fleas is an important aspect of cat ownership. Fleas can spread parasites (including tapeworms) and disease. If your cat has enough of them they can cause anemia from the blood loss, especially in young cats. With your cat on her back, examine your cat's belly and see if you can see any black specs. Run a wide tooth comb through your cat's fur and then wipe it on a wet paper towel, if you see red spots on the paper towel, your cat is infected with fleas. 9. Clip your cats nails - if your cat's claws get too long, they may curve back into the toe pad. 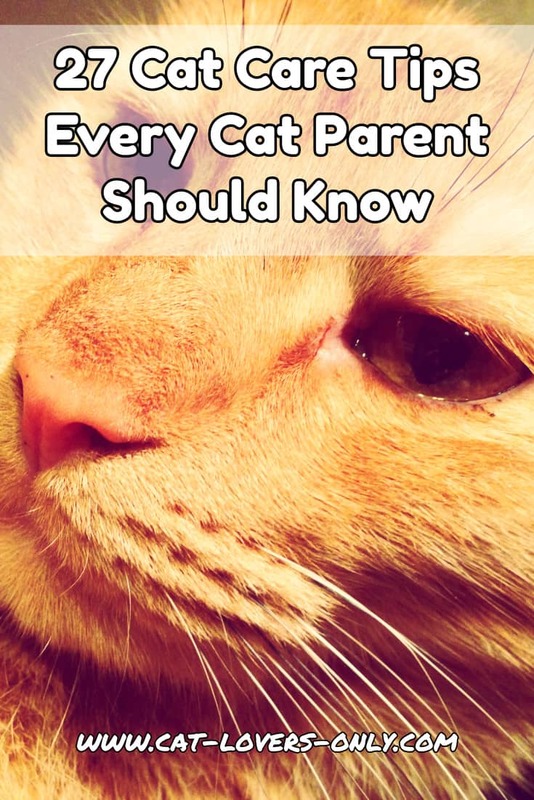 It's also more likely that your cat's claws will get caught on something if they're not trimmed. I recommend the guillotine type trimmer for this. Some cats will put up with claw trimming without too much fuss, but many seem to hate it and need to be restrained. Try to get your cat relaxed and comfortable before you start and that may help. Be certain to be careful and not cut the "quick" as this will cause your cat pain as well as bleeding. Here's an excellent article on trimming your cat's claws. This is one of those cat care tips that you may need help with, as it's easier to have one person hold and distract your cat while you trim the claws. If need be, take your cat to the vet or a groomer and have this done. Here's a great tip from one of our readers on how to make clipping your cat's claws a more enjoyable experience (for both of you). 10. Keep your cat indoors - every major cat care organization recommends keeping your cat indoors for safety, better health, and a longer life. Cats can live out a healthy life indoors, get the exercise they need, and survey their territory from a nice spot in front of the window. 11. Give your cat a taste of the outdoors - as mentioned, if you give your cat a place in the sun (tip number 1), she'll be able to survey her territory from the window. You can also go one step further and set up sun rooms inside. Protected areas outside, such as screened in enclosures, or specifically designed outdoor cat enclosures, allow your cat the outdoor experience with safety -- the best of both worlds. Growing catnip and "cat grass" in containers indoors within your cat's reach is highly recommended as well. 12. Place the litter box in a place your cat likes - one of the most important aspects of cat care is the litter box. The number one reason that adult cats are brought to shelters is for unresolved litter box problems. Place the box in a relatively quiet area that your cat likes to frequent, and make sure there are multiple escape routes. 13. Provide enough litter boxes - follow the one plus one rule... one box for each cat in the house plus one more. This ensures that there's a fresh, available box to use at any given time. 14. Clean the litter box twice a day - keeping the box spotless will help prevent any possible cat litter box problems. So clean the box twice a day and change the litter every few weeks, thoroughly scrubbing the box and disinfecting with bleach when you do. See my guide for more cat care tips related to cat litter box problems. For easier cleaning, there may be a better solution. While they're not without their problems, you can get yourself an automatic litter box. One of the best cat care tips I ever got was to exercise your cat hard. A cat who plays hard and gets enough exercise will be better behaved, less stressed,, and will sleep harder. Increasing your cat's activity level can help prevent a wide array of issues from minor behavior problems to house soiling. 15. Play with your cat - dangle toys for your cat to play with, play fetch, and chase your cat around the house whenever you can. Get your cat exercising every day and you'll help lower risks of diabetes and other diseases. If you exercise your cat more, in addition to having a less mischievous, less stressed cat, your cat just might leave alone long enough to get a good night's sleep. And, you can get some extra exercise in the process. 16. Enhance your cat's fun with catnip - for those cats affected by catnip, you can enhance the fun of toys, scratching boards, or just about anything with a little catnip. You can even just throw some on the rug and watch your cat go wild. Keeping a catnip plant around the house can also curb your cat's desire to eat grass. Teddie eats flowers to the point where you can't have them in the house. She'll seek them out and chew them up. If your cat does this, try keeping a catnip plant around. You can protect the plant by growing it in an birdcage. Secure the birdcage, and let the plant grow through the cage. Your cat will be able to eat the leaves when she wants, but won't be able to totally destroy the plant (which she will if you leave it exposed). You can also buy "cat grass" plants for her to eat as well. 17. Provide interesting cat toys - with most cat toys, you should not leave your cat unsupervised as injury can occur. There are some toys, however, that you an set up and your cat can play with all the time. Be sure to rotate your cat's toys in and out of circulation to keep things interesting, but always leave her favorites accessible. Also, a belt or a shoe lace, if used safely, can make a great interactive toy and provide exercise for your cat, and fun for both of you. You know the felt pads that you can buy for the bottoms of the feet on your furniture? Both Teddie and Priscilla have always loved to play with those. They flip, fly, roll on end, and scoot like hockey pucks. Be careful with any homemade cat toys as they may be less safe for your cat to play with. 18. Take your cat for a walk - some cats won't go for this, but if your cat does, you can walk your cat on a leash. Collars don't work well for cats, so you'll want to get a harness. Cats can easily wiggle out of collars, and they don't take well to being choked - as a training method, that just won't work. Also, you'll usually have to work up to this in stages, letting your cat get used to the harness, then the leash, and so on. Be aware that bringing your cat outdoors exposes her to certain dangers and risks of disease. This is one of the more dangerous of the cat care tips listed. When you take your cat outside, you increase the risks of your cat being hit by a car, attacked by an animal, or picking up a disease. Make sure you discuss these risks with your veterinarian first and ensure that your cat has been properly vaccinated. 19. Give your cat at least 10 minutes of physical attention every day - stroke and scratch your cat for at least 10 minutes a day. It will sooth both you and your cat. In fact, recent evidence shows that contact with cats may reduce your risk of heart attack by as much as 30 percent! 20. Talk to your cat every day - this is one of my rather odd cat care tips, but... have you ever wondered why cats come to visit people when they're on the phone? It's been speculated that your cat thinks you're talking to her when you're on the phone. In a soft, high voice, talk to your cat every day. You'll both like it. 21. Get your cat a playmate - two cats are better than one. When you can't pay attention to your cat, another cat in the house will. A second cat around the house will offer comfort, encourage exercise, and reduce boredom. Much has been said about cats being loners or not liking the company of other cats. While it's true that some cat owners have reported that their cats do not get along no matter what, it's not clear that those cat owners have approached the problem correctly. The domestic cat descended from solitary creatures and retains a number of legacy traits, but I firmly believe that most cats enjoy the company of other cats. This is especially true for certain cat breeds as I describe on this page about the Siamese cat. On a personal note, I have seen an intense relationship grow in my cats, despite the fact that Priscilla was very disturbed when she first met Teddie and Frankie. Over time, she grew to become their caretaker, and all of them play together like perpetual kittens. 22. Provide enhanced comfort - Allow your cat to choose favorite spots, then make them more comfortable with blankets and pillows. 23. Let your cat sleep with you - While some people, especially those with allergies may not want their pets sleeping with them, I highly recommend it. It's a way to enhance the bond with your pet, and often makes your cat feel more secure. 24. Feed your cat premium cat food - choose a premium cat food for your kitty's primary diet. High quality cat foods meeting AAFCO cat food standards will ensure that your cat gets a balanced diet with the right nutrients. Feline diets deficient in certain nutrients can cause diseases, including blindness (taurine). Beware of people promoting special diets for your cat that may not include balanced nutrition. 25. Take your cat to the vet - at least once a year, or every 6 months if you can swing it, your cat should visit the veterinarian. This is another one of my cat care tips that seems obvious, like the spay and neuter recommendation. Yet, cats are often neglected in this area. Some people feel that cat's don't need to see a vet unless they're ill, but it's very important that you keep your cat's health in check with at least annual visits. Cats are good at hiding pain and illness. Kittens need to go more often for the initial sets of testing and vaccines. From then on, get your cat to the vet and vaccinated per the schedule that your vet recommends. 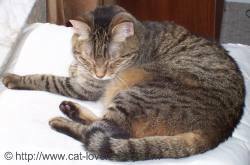 Older cats, or cats with special medical needs may need to go several times a year. I should add that the American Veterinary Medical Association now recommends that your cat see a vet twice a year. If you need to buy medication for your cat, you can buy online and save money. 26. Give your cat filtered water - They don't like or need all the chlorine and other chemicals in tap or bottled water. This tip is from Suze from NH, USA. I hope these cat care tips are useful to you. 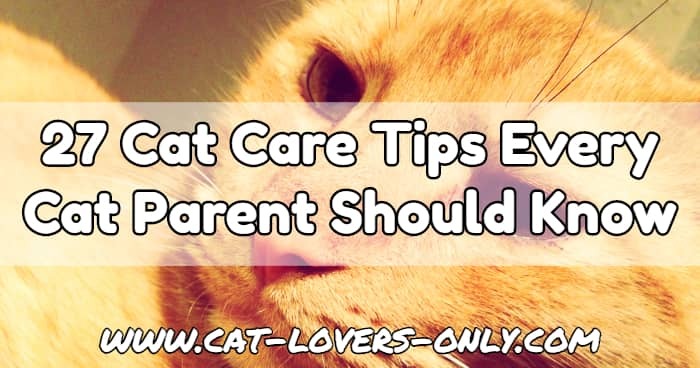 You can find many more tips on various aspects of cat care, health, and ownership throughout the site. What Are Your Top Cat Care Tips? Do you have some great cat care tips that have worked for you? Something that will make another cat owner's life easier? A tip that will enhance the life of a cat or cat owner? Share it! Describe your tip in detail, how you discovered it, and what the benefits are. Multiple related tips on one page are OK (say, 3 grooming tips), but it might help if you have several very different tips to do a page for each. While you're at it, you can add a cute or funny story about your cat if you like. Get your cat to drink more water! Rochelle has a friend with a 6 year old son and their kitten they've had for a few months. He's always been gentle with the older cat, but her son isn't being very careful with the kitten. If you can offer any insight, please click the link above and join the discussion. Your input will help future visitors. Can You Help?